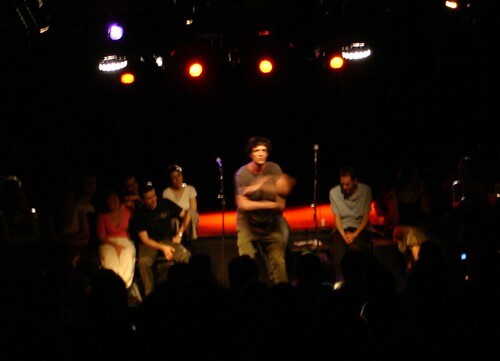 At the end of the slam poetry soirée I had just attended, one of the slameurs – in one of his usual, but extraordinarily forceful performances – had ran onto the chairs among the audience and screamed the end of his poem standing on his knees on two chairs right in front of me. I can’t say for certain that I understood exactly what his text was about, I must to admit (I was outside when he started, and due to the seemingly explicit content I’d like to be sure before I go into it. My illness made me a rather bad researcher as well as bad company yesterday….). Images from his performance, the incredible heat in the small exhibition locale, the animated audience and many of the others – slammers, poets, story-tellers, toasters, mc’s, rappers – made its way into my imagination last night and disturbed my sleep in an unpleasant, but not uninteresting way. Cycling home in the night, I cursed my poor state of health and wondered what could have happened if I had hung around outside the locale a little longer as people stood chatting or if I had joined the group who went down to Canal Saint Martin to do a slam sauvage there. (I just got two enthusiastic, though apparently tired, text messages from one who had been by the canal: “Quelle nuit,”...). I think these regrets, as well as the anxiety about the project and sadness for having to leave just now when things are so great, contributed to my stormy sleep. I’ll probably provide some links and stuff for the slam poetry scene later, but for the moment I’m not yet sure how I’ll go about the important issue of anonymity if this is really what my Ph.D. project will focus on. I’m hesitating before writing the final paragraph. In several posts earlier in this blog, I’ve made reference to the skin colour of the people present. I’ll to that now as well, but with a reluctance which I’ll explore somewhere else: The group going down to the canal consisted of eight people with the following traits: black, Chinese, North African (the only girl except from me), one seemingly white (10-22 years older than the rest of us) and one seemingly Latin American and three European/whites (East, half Balkan and North (me)). The ethnic mix among the ones hanging around after closing time was about as diverse.